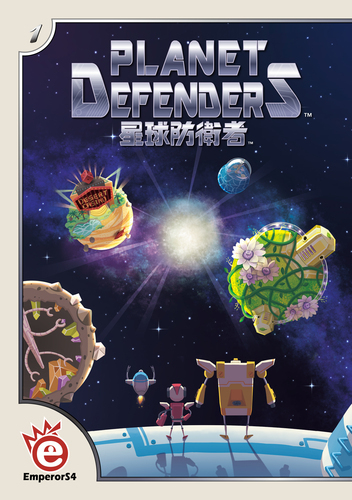 Planet Defenders* is a set collection, resource management and order fulfilment gateway game from Taiwanese publisher EmperorS4. While it has a cute sci-fi theme it is pretty much an abstract game for two to four players that plays out in less than an hour. While the box says 10+, younger players with an aptitude for mathsy problem solving will be right at home with the game. The box is medium-sized (think large hardback novel) and should set you back less than £30 when easily available (hopefully it will get better distribution in the west in 2017). 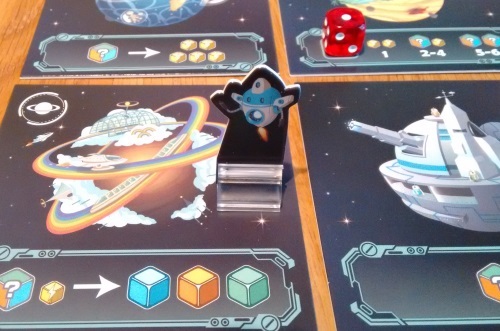 In the box you’ll find the nine modular board pieces, the three planet defenders (cardboard standees), 60+ plastic cubes, 50+ cards, four small player boards, three planet defender control boards and one lonely dice. The pieces are all high quality and the artwork and graphic design is exemplary throughout – this does not look like a game from a new publisher. As mentioned above, I’d class Planet Defenders as a gateway game – and as such, it is suitably simple to understand and explain. 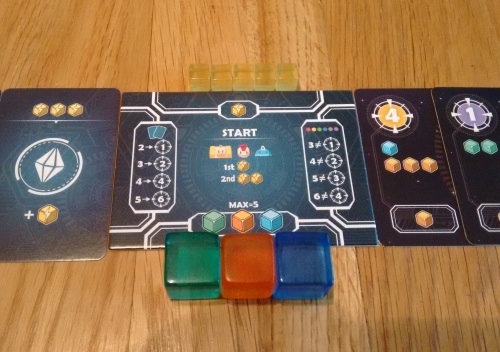 The board is made up of nine different tiles (placed randomly), with our three intrepid planet defenders starting on the central space (the only one that is always the same tile). Instead of having one planet defender each, all the players share control of these robots. On a turn you can make two moves with them, getting the benefit of the planet you move a robot to (which is always battery or energy cubes). However, you are limited in who you can move: the three robot control boards have a robot on each side and a number (one or two) – being the number of spaces you’ll have to move. These only flip over at the end of each player turn, and each can only be used once per turn, so you’re quite heavily restricted – but with such a small board, it doesn’t feel bad. For example, you may have the ‘Yellow 1’, ‘Yellow 2’ and ‘Red 1’ face up at the start of your turn. So whatever you do, you won’t be moving the blue defender this round – but could possibly move the yellow robot twice (or the yellow and the red). Once you’ve moved you get to do an ‘extra action’ – which is where you can spend the cubes you’ve been collecting. Next to the N, E, S and W planets will be a pile of robots that need to be captured by the defenders. One thing you can do is collect the top one (which will be face up) by paying the cubes indicated – as long as you moved a robot to an adjacent space on your turn. These give a small cube reward in return, as well as end game victory points (most of your points come from these guys). Alternatively you can buy a technology card. The more of these you collect he more end game points they’ll be worth, but they’re more important for making other aspects of the game easier. Variously they’ll give you discounts on catching robots, let you trade cubes for other types, give bonuses for landing on certain planets, or let you move robots further. Depending on player number, the four robot stacks will contain either four or five robots: once two of these stacks are empty, the game is over – simply count up your points to see who won (with leftover energy cube acting as a tiebreaker). The writer: This is a purely tactical problem solving game that works very much as a puzzle. You’re restricted to a maximum of five energy cubes in your player area, meaning you can’t just hoard what you need to catch any old robot (battery cubes are largely used to move, but are unlimited) – you need to get what you need, grab the card you want, then choose a new target. The trick is getting enough tech cards to streamline your plans – while leaving enough time to grab enough robots to win. The thinker: This is an enjoyable (if slightly forgettable) puzzle game. There is a variant included that allows you an ‘extra’ extra action each turn, while allowing you to mix your moves and actions at will. While adding more possibilities to make the perfect turn, what it really does is pile on the opportunities for analysis paralysis. Unless you all want the game to last a lot longer (something I don’t think the depth deserves), I’d stick to the simpler version – and it’s not often you’ll hear me say that. 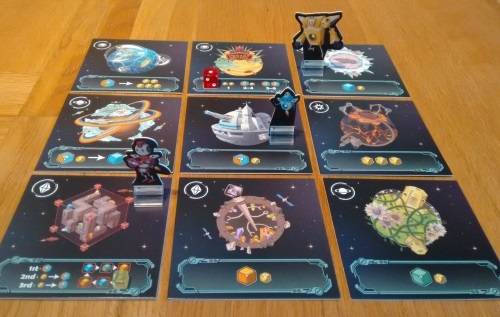 The trasher: With more than two players, Planet Defenders is an exercise in tedium – you’ll spend most of each game waiting for your turn, knowing you can’t plan until it gets to your go. However, on your turn you have some interesting choices to make including ways you can restrict the next player; hence why it’s much better with just two players. Two defenders can’t occupy a single space, so if you know your opponent wants to go to a particular space you can usually leave a robot on it – and then not allow it to be moved next go. Very satisfying when you can pull it off! The dabbler: Both the lovely cartoon artwork and gameplay simplicity drew me into this one and I never really mind a bit of downtime – especially when you can joke about what the various robots may have been doing for jobs! The Robocop one and builder are pretty obvious, but there’s also a floating garden, a vending machine and what looks like a carwash! The whole story is as if Studio Ghibli did a take on Bladerunner – and it works beautifully, despite being pretty abstract. My main takeaway was how well the flipping mechanism worked when choosing which defender to move – I expect to see this a lot more in games in future (including mine!). But it really is best served as a gateway game. I’ve played with more experienced gamers and with the exception of two-player it comes across as pretty forgettable for many. But if you have kids or non-gaming friends who like a bit of sci-fi or manga, I think Planet Defenders will be really well received by them. This isn’t a criticism of the game at all – you just have to pick your audience. But I’ll certainly defend it as a two-player filler for any gamer who is happy playing puzzly abstract titles: there is a lot of hidden depth here and when you take the downtime away it can be a really enjoyable head-to-head challenge. Some say the game is a bit samey – a criticism you can often level at order fulfilment games. But I don’t really buy it here, as the choices you make in the buying of the technology cards help shape your strategy and these will come out differently each time (as will the modular board). Is it a ‘play back to back games’ game? No. But with five plays under my belt I’m definitely still reaching for it. One issue is availability (December 2016). I’ve linked to EmperorS4 below, but it seems the Taiwanese firm hasn’t managed to get the game into any western distribution channels as yet. That said, both this and the company’s other Essen 2016 release Round House have been getting positive buzz – so finger’s crossed. There are a few copies floating around on Board Game Geek, at least. I’ve been thoroughly charmed by Planet Defenders. From the artwork to the simplicity to the playtime to the components, it ticks every box. It’s definitely best with two (or more if you don’t mind chatting between your moves) and falls firmly into the gateway and abstract camps, but those aren’t reasons to knock it. I really hope EmperorS4 can get wider distribution for its titles and I look forward to playing more of its titles in future: definitely a company to keep your eyes on. * I would like to thank EmperorS4 Technology for providing a copy of the game for review.